For some couples, when you know, you just know. For Neil and Katie Sime, their eyes met over a pool table and they’ve never looked back! 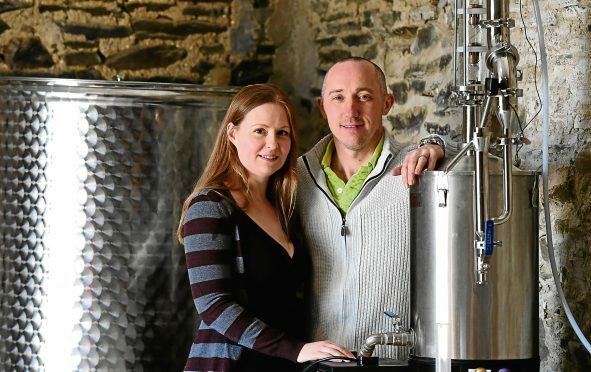 We spoke to the couple behind Blackford Distillery, where they create the sublime Vesperis Pictish Gin in a distillery on the grounds of their home to find out about their journey and what it’s like to run a business with your other half. Bar Oz, Edinburgh, Hogmanay 2009. My friend and I had come up from Winchester for the New Year celebrations, we didn’t know where to start the night and discovered this quietish bar, avec Pool tables, on the Grassmarket. Neil was living in Edinburgh at the time and at the last minute decided to play a game of Pool with his mate, before going on to a party. I was taking a shot and happened to look up as he walked in, he was wearing a kilt, I was playing Pool, it was meant to be. 30 mins either side and we would have missed each other and 9 years later we’re married with 2 beautiful children, own a house with a few acres and run a distillery from the steading. We had a bit of a eureka moment early in 2016. Neil used to work away a lot so we always planned to work together and start our own business. Neil particularly wanted to make something, he’s very creative, but it’s not easy to find a business we were both passionate about and which suits the talents of a secondary school Humanities teacher and an Oil and Gas engineer. We’ve always been spirit drinkers, Neil is the vodka drinker and I am the gin enthusiast, so with the very welcome rise and love of craft spirits it seemed very natural to convert our unused steading into a working distillery and launch Vesperis Pictish Gin. Family time. We try to make sure that we take at least one day off a week to spend with our children, that day is all about them. We also enjoy hiking, it’s not easy to find the time and have to work around the weather, but when we do Bennachie is our location of choice. There’s a real sense of achievement in getting to the highest point in Aberdeenshire and the view is incredible, on a clear day you can see from the sea to the mountains. We went to Paris for Valentine’s Day one year, I’d really like to do that again, but this year I’m looking forward to a hassle-free M&S Valentine’s dinner, a glass of sparkles and watching a good film in front of the open fire.